FUSION®, a worldwide leader in marine audio entertainment, announced today the launch of the revolutionary Apollo Series marine audio entertainment system. Building on FUSIONâ€™s industry recognised True-Marine design philosophy, the new Apollo Series will forever change the face of marine entertainment and set a new standard by which all others will be created. The FUSION RA770 is the flagship of the new Apollo Series, epitomising creative design and technological brilliance. The worldâ€™s first purpose-built marine entertainment system with a one-piece glass touchscreen display, built-in Wi-Fi streaming, Digital Signal Processing Technology (DSP) and PartyBus capabilities, the RA770 takes marine audio entertainment to the next level. Featuring a brilliant, optically bonded, full-colour LCD display, the RA770â€™s one-piece glass touchscreen makes trying to locate the right button a thing of the past. Users can simply tap the screen to pause and play, or swipe through a playlist to find their favourite song. The stylish display blends perfectly with modern glass helms and is an attractive addition to any steering station. The FUSION Apollo Series also includes the SRX400, delivering a truly powerful feature set in a compact versatile form factor. Like the RA770, the SRX400 offers Wi-Fi Streaming, DSP and PartyBus functionality. For the pinnacle of sound quality, the Apollo Series harnesses the power of FUSION DSP, providing premium audio delivery to all speakers in any environment. FUSIONâ€™s system approach ensures every step of the audio chain is optimized through calculations by its audio engineers to deliver a technically superior listening experience â€“ without the need for boat owners to have a technical understanding. Setting up DSP profiles is made simple with the free FUSION-Link app. With just a few clicks, boat owners can set up the preconfigured DSP profile to play high-quality audio customised for their ears and their specific environment. Precisely calculated loudness curves optimised for the human ear ensure quality audio delivery at every volume level, giving quality, full-range sound whether the volume is turned all the way up or all the way down. 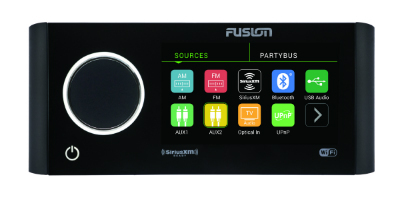 PartyBus is FUSIONâ€™s audio distribution network of the future. Engineered for those who value freedom of musical choice, to play what they want, where they want, PartyBus gives boaters the power to command the party across the whole boat or quietly relax in a single cabin, regardless of othersâ€™ preferences. The power of PartyBus kicks in when users add more PartyBus enabled stereos to their on-board entertainment system. Each additional PartyBus enabled stereo gives the option to join Party Mode and play the same perfectly synced audio source through the entire vessel. Boaters can also opt into Personal Mode and listen to available audio sources from the stereo in their zone of choice without disrupting Party Mode in the other areas of the vessel. Offering more source options than ever before, the Apollo RA770 offers users the ability to play their favourite soundtrack via Bluetooth, Optical Audio (TV), Advanced SiriusXM features (USA only), DAB+ ready (available in Europe and Australia only), AM/FM radio, AUX and USB. The worldâ€™s first marine Wi-Fi stereo, users can finally stream music from a mobile device via Universal Plug and Play (UPnP), providing the highest quality audio streaming available. With the built-in Wi-Fi, the Apollo series can also wirelessly connect multiple Apollo stereos without running any cables, reducing installation time, cost and complexity. The FUSION Apollo RA770 and SRX400 feature a 4.3-inch and 2.7-inch display, respectively, are IPx7 rated for dust and water protection from the front when installed correctly, and include an internal Class-D amplifier. The RA770 has two RCA auxiliary inputs, one SPDIF port for TV audio output, one Ethernet port, one USB 2.0 port for phone charging and media playback, one SiriusXM port, one Motorola antenna connector port and it is DAB+ ready. The SRX400 has one Ethernet port and one Motorola antenna connector port. Both devices offer multi-language support and include English, French, German, Spanish, Dutch and Italian settings.